Huzzah! And a good morrow! The Medieval Fair of Norman, Oklahoma is a great way to journey to the age of kings, queens, and knights in shining armor – if only for the day. Step back in time to experience all the revels of the Medieval Fair. Mirth and merriment are sure to find you as history comes alive. This living history fair features arts, crafts, food, games, educational exhibits, demonstrations and ongoing entertainment at seven stages. You can feast like the people of yesteryear with turkey legs, roasted corn, or hand-crafted root beer. And you can even find some less-than-yesteryear treats like yummy funnel cakes. Or maybe you prefer to dress like the merry gents of yore. 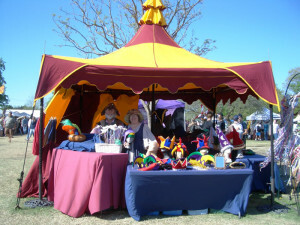 There are costume contests and even vendors that sell medieval clothing. Of course you may prefer to just view the beautiful costumes, of which there are all different kinds and characters – knights, jesters, and all assorted royalty. Costumed or plain-clothed, there’s nothing quite like witnessing a jousting tournament, a human chess game, or appearances by the queen and king of the fair. You can also see jugglers, minstrels, dancers, musicians, and other unique entertainment. You can ride on the King’s Carousel, a hand-crank carousel. Or you can practice your star throwing or archery skills. Vendors abound at the Medieval Fair. Jewelry and jewelry making, leather goods, swords and shields, pottery, and stained-glass, among others fill booths as you experience the greatness of the medieval era. 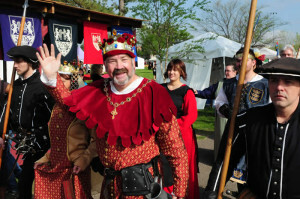 The Medieval Fair Norman OK 2019 has been going on for more than 40 years. What started as an one-day, on-campus event for the University of Oklahoma’s English department, gained so much popularity in the early years that it quickly outgrew the single day, and even the campus. Since 1977, the fair has grown to offer more days and include more visitors. Now, the Medieval Fair is now being held in Reaves Park, one of the biggest parks in Norman, OK. The now three-day event is a free and delightful experience for young and old alike. And after you’ve spent your day with the king and queen of the fair, you can look forward to being treated like royalty at the Montford Inn. Whether you choose one of the ten cozy rooms or one of six private cottages, you’re sure to feel like a member of the royal court. 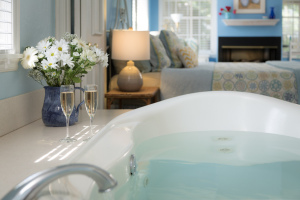 With comfy bedding, whirlpool tubs, and fire places, our hospitable staff will be sure to make you feel like king or queen, even if just for the night. Delicious, homemade breakfasts await guests every morning. But our favorite royal treatment of the day is the afternoon fresh-baked cookies. With the Montford Inn just 2.5 miles from the festivities, you’ll be able to party like it’s 1422 from the Fair’s open to close – and not miss out on one relaxing moment back at the Inn. We’d love to see you while you’re in town for the fair. We invite you to check on our availability to get just the room or cottage you want to make your fair experience extra special.